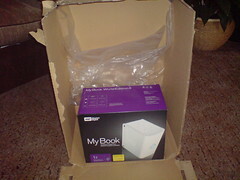 Why on Earth did this company use such a huge box to sent ms such a small item? It makes no sense! On a side note, yes, I’ve recently bought a terabyte of network data storage!